If there’s one thing Mother Nature has mastered in Canada, it’s creating a series of landscapes that are nothing short of visual poetry—masterpieces that need to be seen to be believed. And while Banff National Park is just a tad too big to be called a “hidden gem,” it’s definitely one of the jewels in Canada’s great crown of must-see natural wonders. 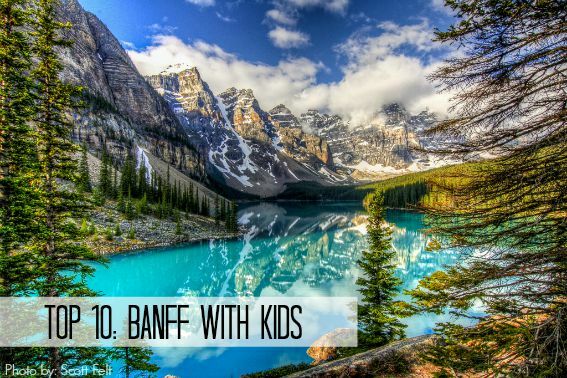 Check out this guide to the top things to do with the family in Banff. 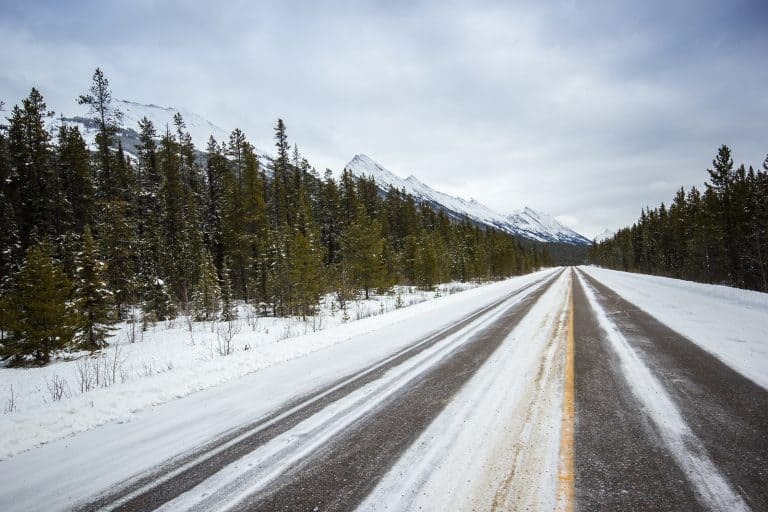 The drive alone from Banff to Lake Louise and back again is spectacular—flanked by the Rocky Mountains, millions of evergreens and several bodies of water frozen by the crisp mountain air. With more than 6,600 square kilometers to explore, Banff National Park is a winter enthusiast’s wonderland. There’s no better place to take advantage of quintessential Canadian activities within a half-hour radius. I mean, obviously, right? 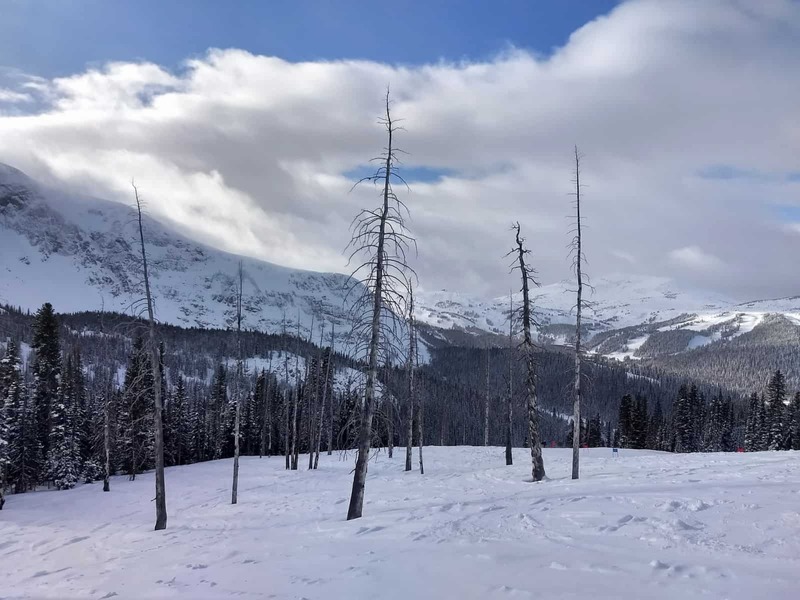 This is a skier’s paradise and within the park itself, there are three options: Lake Louise Ski Resort, Banff Sunshine Village, and Mt. Norquay, each offering something unique. For those OMG postcard-perfect views of the Rockies at every turn, look no further than Lake Louise Ski Resort. It also offers daredevils and expert skiers some of the most challenging terrains and bowls in the country (plus it has Level 4 instructor Tom Bazley on staff). Banff Sunshine Village is everything one wants in a family-friendly mountain, with runs for every ability available from the top of nearly every chairlift. It’s set amidst meadows with the mountains in the backdrop and allows even novices to ski through trees. Oh, and it boasts one of Canada’s only heated chairlifts, too. Mt. Norquay, though smaller scale, is the only mountain in the area with night skiing. A SkiBig3 pass gives you the flexibility to ski at all three resorts. The Post Hotel & Spa is one of Canada’s few Relais & Château properties and provides guests with upscale yet relaxed charm along the Bow River, unparalleled service, free ski shuttles and award-winning food. 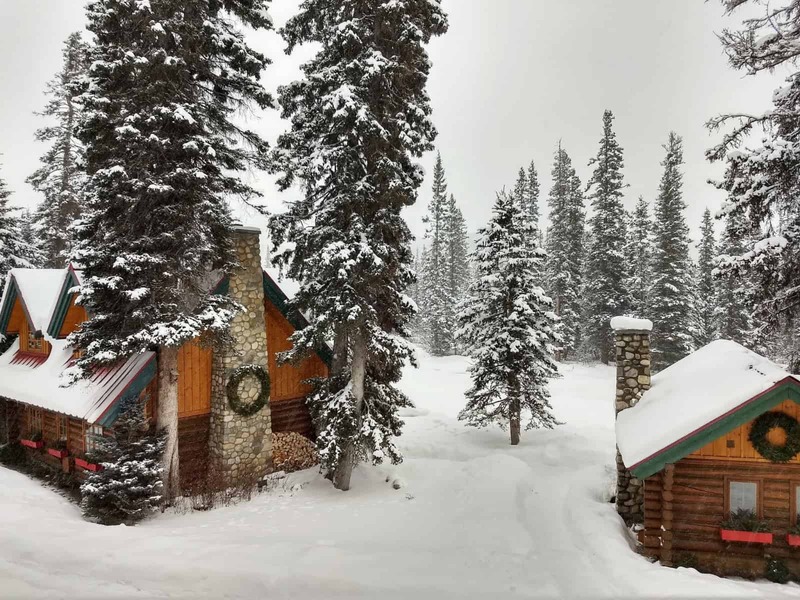 Rooms and décor are Swiss-inspired, many with wood-burning fireplaces (and an unending supply of kindling and wood during your stay) and it’s less than five minutes from Lake Louise Ski Resort and only half an hour or so from Banff Sunshine Village. Its boutique feel with world-class amenities will make you want to move in. PRO TIP: If you need to rent gear, Adventure Hub in downtown Banff is the only company that will deliver to and pick up your rentals from any hotel in Banff or Lake Louise, including The Post Hotel. For free. Start your 16-kilometer adventure in Lake Louise and take a loop through The Great Divide, where it’s Alberta on one side and British Columbia on the other. And do it all behind eight Alaskan Huskies, known for their incredible stamina. 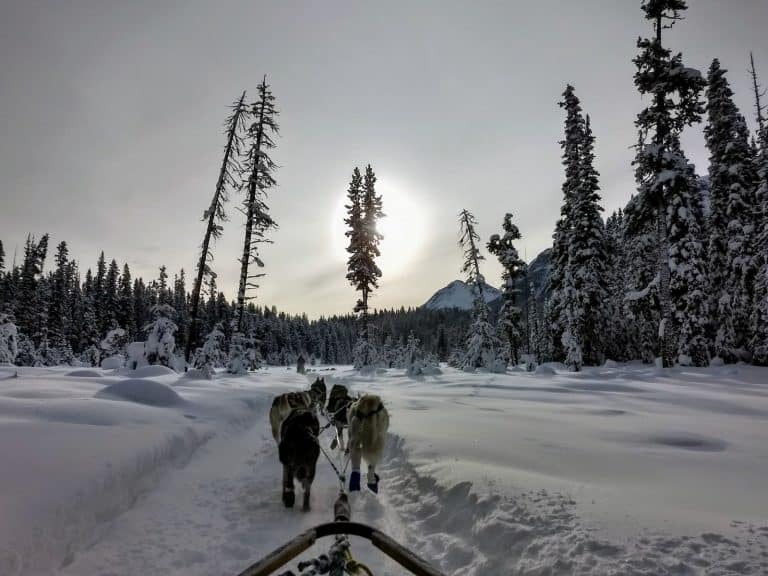 Kingmik Dogsled Tours — an ethical dogsled company with a small outfit, ensuring personal attention and care for every dog — will even teach you how to drive on the way back. 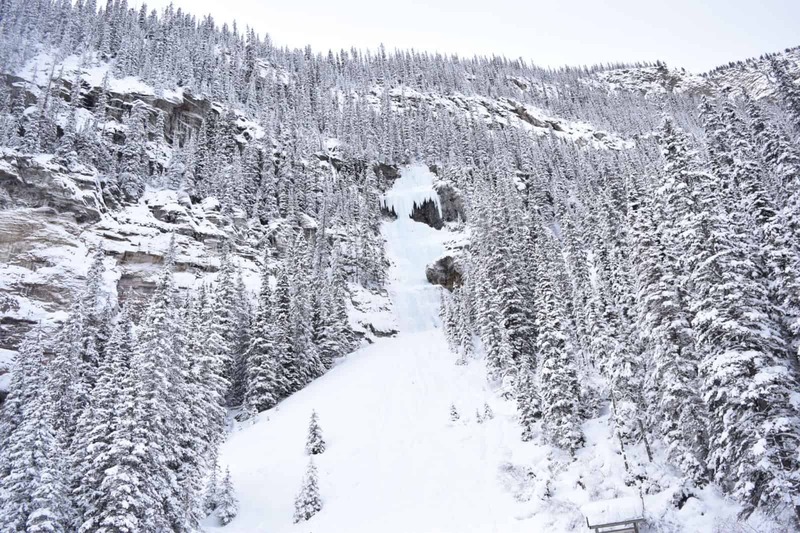 Take a one-hour horse-drawn sleigh ride from the Chateau Lake Louise to see blue-tinted glacier water frozen in time on a mountainside. Trust me, it’s so much better in person. If you love to eat, there are plenty of options both on and off the mountain in Banff National Park. 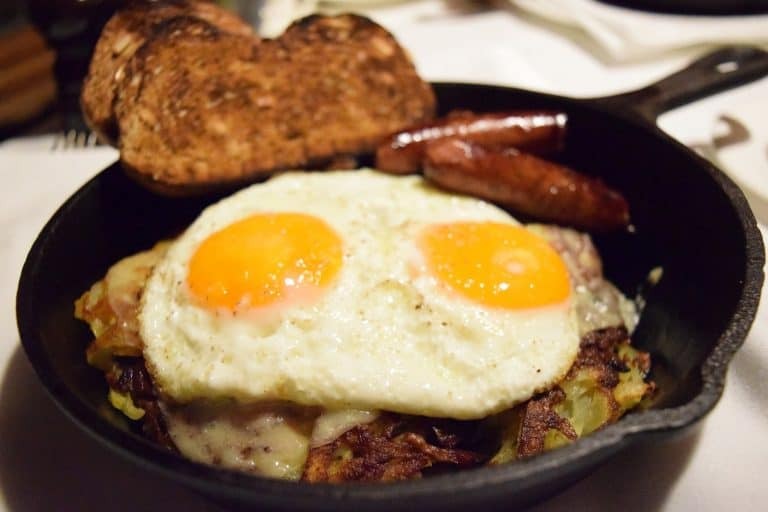 For a real treat, splurge morning, noon or night on the rösti, fondue or six-course tasting menu at The Post Hotel’s restaurants. At Lake Louise Ski Resort, indulge in refined mid-mountain eats like bison short ribs at Whitehorn Bistro, which sits at 6,700’ elevation. If you’re spending the day at Banff Sunshine Village, make a reservation for lunch at Chimney Corner for fireside dining and pork belly gnocchi that’ll give you enough energy to ski or board until ski patrol kicks you out at the end of the day. 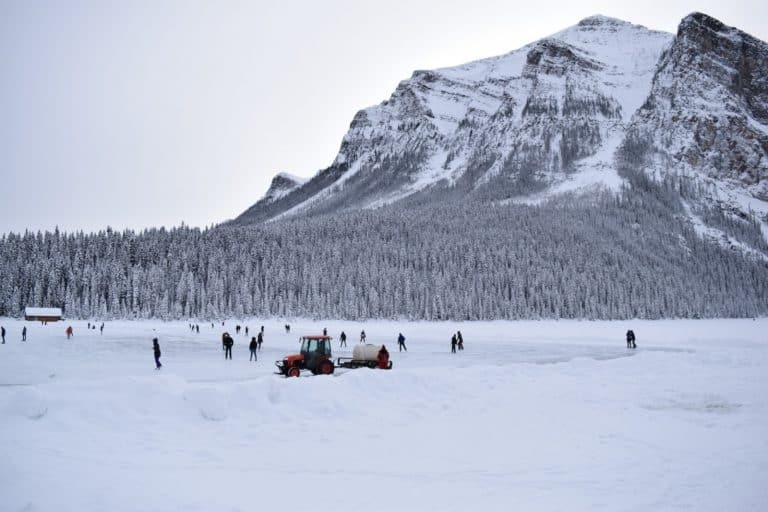 Whether you’re a skating pro or first-timer, it doesn’t get much more Canadian than skating on a natural lake “rink” in a national park beside an ice castle. There are skate rentals available for a couple of hours or the whole day, and a large section of the lake is serviced by a makeshift Zamboni that helps smooth out the surface. From souvenir and brand-name shops to wonderful bars and restaurants, you could easily spend an afternoon exploring the main strip. Be sure to grab a hot beverage from Wild Flour Bakery while you wander (hint: the mocha is made with divine chocolate ganache!). Flying into Calgary and don’t want to rent a car? No problem. Both Banff and Lake Louise hotels and ski resorts are serviced by various shuttles — some of which are free. Pay attention to Brewster’s airport schedule before you book flights, and get your tickets in advance to guarantee a seat at your preferred times. 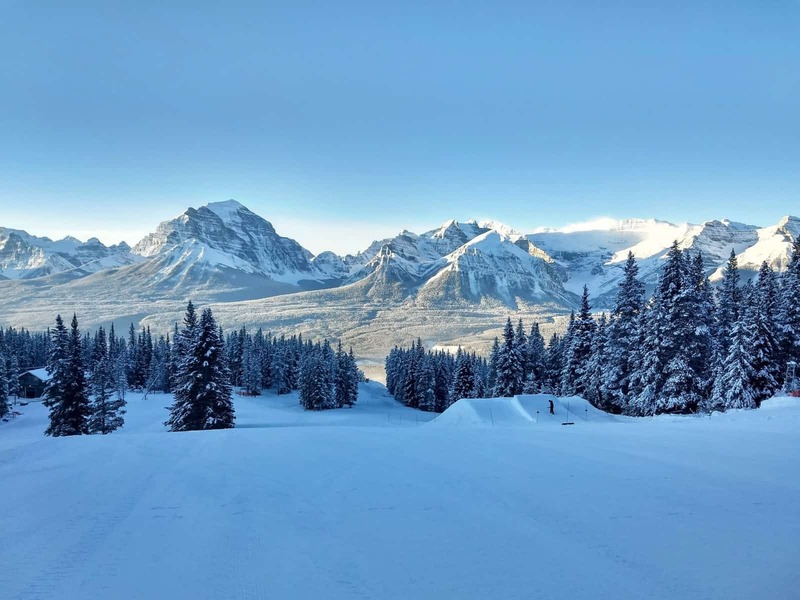 Getting to and from your hotel and the mountains is free and easy thanks to the SkiBig3 shuttles; within Banff, shuttles are available daily, while from Lake Louise hotels to Banff Sunshine Village, it’s two to three times a week depending on low versus peak season. Those first mountain views are nothing short of breathtaking. Don’t say you weren’t warned. Looking to visit again in the summer? 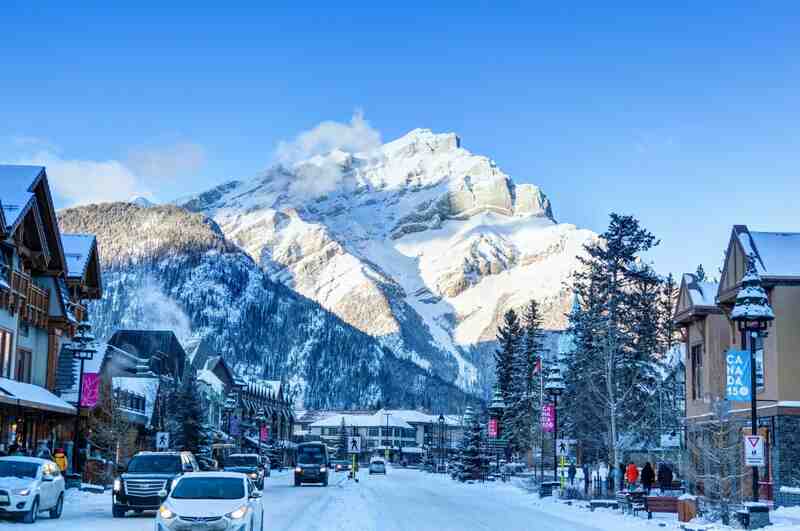 Check out our post on the Top 10 things to do in Banff year-round. Andrea is the founder of award-winning lifestyle and travel site mommygearest.com, and lives with her family in a cookie-cutter Canadian suburb.